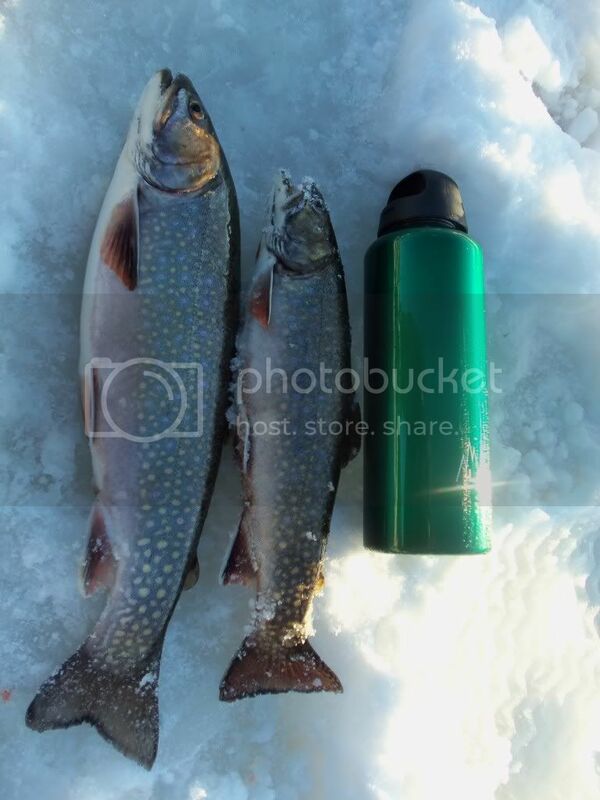 Anyone have any experience fishing for Brook trout through the ice? What do you use for bait? What depths? Any other tips? Silver and blue Little Cleo tipped with a dace minnow. I usually fish the outside of fallen timber, anywhere from 10 to 20 feet deep. In the lakes I fish, shallower is often better than deeper - we rarely fish deeper than 15' and often do best in 3-6', especially first thing in the morning. Besides the fallen trees, if you can find a beaver house in any area that's 3' deep or deeper, there are usually trout hanging around them. Good luck and post the pictures when you catch them! Anyone ever tried the Gulp waxies or larvae? Brookies on hard water? Other than the venerable shiny spoons and EGB's? Two words my friend...salted minnows. Small minnows on a jigging spoon. Working the upper third of the water column seems to be most productive for me. Live minnows, and in 5' to 20' of water. Always near some underwater obstruction.